Hello blog peeps – sorry, it has been a long time! But a belated Happy New Year to everyone reading this and I will try harder to blog more frequently. A lot has happened! A new year, 2015! I am sure, though this could be showing my age, that when I was little, 2015 seemed such a long time away that it was almost space ageish, but here we are. A quick recap of the second half of last year saw us winning another gold at Nantwich for our goat curd, making it two golds on the trot for two years, of which we are very proud. One of our new cheeses (Gouda Gold) won three gold stars, got into the Top 50 at the Great Taste Awards and were put forward for the Golden Fork award. I was invited – and went- to the award ceremony dinner in London. It was very swish and a massive honour and I made a new cheesey friend: Sarah also a goat cheese specialist who owns and runs a Shropshire based cheese making firm called Brockhall Farm. I also discovered that Wholefoods, High St Ken stock our cheese as I was staying close by and wandered in for a look at the cheese counter. We picked up a few new customers which is always a good thing and I have been out and about on the road a fair bit. 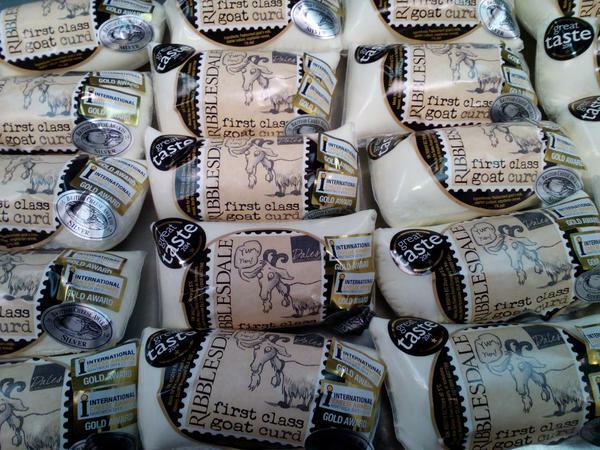 We now make four natural rinded cheeses, two goat, one sheep and an unpasteurised Wensleydale. Part way through the year, our landlords Phil and Amanda sold our unit to another landlord. Nothing has changed, just a change of ownership, life goes on and business is as usual. 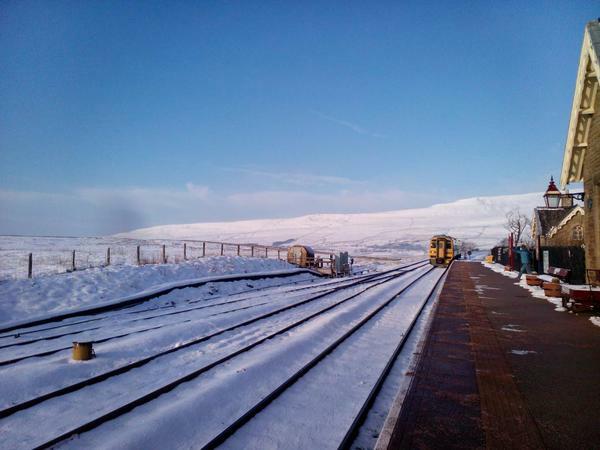 I went to meet our new landlord yesterday, taking the train from Ribblehead Station, which is my nearest station on the Settle to Carlisle line. it. Then new label regs came in which has been very tedious! And then we were audited, only we weren’t,cos it was called off at the eleventh hour, it was a fair bit of work, though on the plus side, it did make me tighten up some of our procedures. For example, we now test all of our milk deliveries for antibiotics instead of replying solely on supplier assurances. Stu bought a new Android phone and I followed suit, not that I know how to use it. And Pipsqueak, Stu’s dog has a new microwaveable pillow for the winter and is, as I type, tucked up under a puffa jacket and on top of her nice, warm pillow. I checked, they don’t make them big enough for pigs. Penny and Snouter are both completely fine and well, though more than a little bored with the weather. In November, I went down to London to help at Brytec’s stand (our equipment suppliers) who were exhibiting at the Farm Business Innovation show, Olympia. If we had been either hot tub purveyors or gypsy caravan makers, I think we would have done a roaring trade. We have been plagued with problems with our forklift and eventually, a couple of weeks ago, this January, we ‘forked’ out for a completely new set of batteries for it and now it is happy again and working really well. It is amazing what you use forks for! Lifting milk, shifting pallets of cheese about, taking pallet deliveries of boxes and wax off wagons and so on. This January has been a ‘let’s buy’ month. As well as getting the forks fixed, I have bought new blue cheese cloths, more goat curd pots, more boxes, more weight ticket labels, more wax and attempted to buy more moulds, but our moulds have been discontinued and the newer version (we received a sample) are too deep and don’t press well. 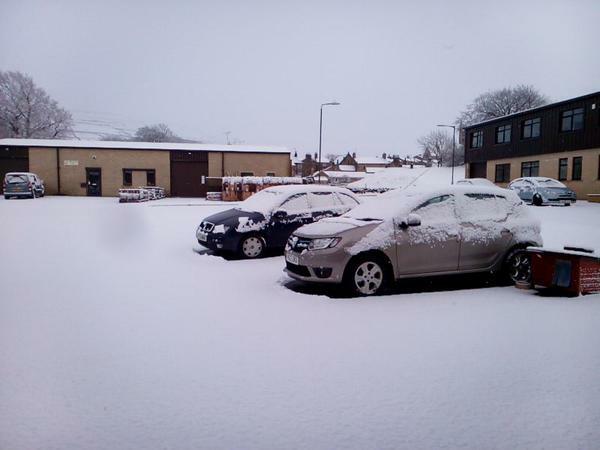 Christmas happened, came and went and then snow, which has been very trying and not fun at all. But we had a good trading Christmas, thank goodness and although Januarys’ are known to be fairly dull, it’s not been too bad for us so far. Two of our cheese class alumni have gone into commercial production: Simon at Weardale Cheese and Chloe from Halifax. Congratulations to the pair of you – am very proud of you both and hope 2015 brings you all that you wish for. There are some cheese class dates for Feb to April here. Wishing everyone fantastic things for 2015! Very nice, now tempted to sneak off to the kitchen for a little goats cheese on a cracker! Your blog also reminded me to add Sheep cheese to my shopping list. Thank goodness the Farm shop stock it on the top road. Hey, Jane, am glad we inspired you and how nice to have such a lovely farm shop at the top of your road!